We all feel a special connection to the trees that grow on our land and in our communities. Creating GREAT experiences through our love of trees. Caring for the urban forest is our mission — we seek to always improve our environment. Even when managing an epidemic such as Emerald Ash Borer, we diligently look for safe, effective, and organic solutions. Get in touch with us and we’ll send out a certified arborist to inspect your trees and make recommendations that make sense for the health of you and your property. We are tree people, but we’re also people. From our first contact, consultation, and estimate to our comprehensive services, Taddiken Tree Company certified arborists bring a friendly and helpful attitude with excellent customer service. We’ll get to know you and your trees, so that giving your trees and plants the best care will also fit your priorities. We take a holistic approach to tree care, whether the tree is a fruit tree, an ornamental feature, a stand-alone specimen, or part of a forest. From the soil under your toes to the air around your hair trees need us to remember and respect their natural habitat. So, for more than a decade, Taddiken Tree Company has led trees in the right direction, helping them grow strong to endure the harsh winds and storms we experience in Boulder, Denver, and along Colorado’s Front Range. 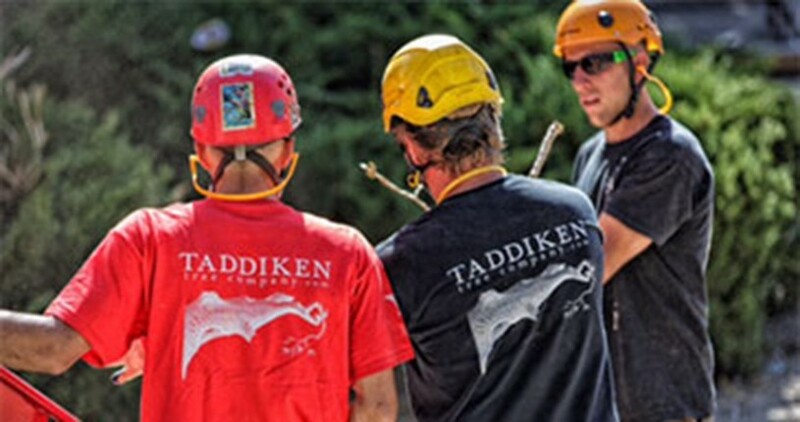 Taddiken Tree Company is committed to the continuous advancement of tree care safety, science, industry innovation, professionalism, and public education. International Society of Arboriculture (ISA) Currently we staff five ISA Certified Arborists and one ISA Board Certified Master Arborist. We encourage and sponsor all of our employees to obtain and maintain these credentials. Tree Care Industry Association We are a TCIA Accredited company. Accreditation is a rigorous audit process that ensures companies meet or exceed industry standards including, Safety, Training, Customer Service, Ethics, Financials, Insurance and Regulatory Compliance. We have been accredited since 2007 and just completed the re-accreditation audit again in 2013.